Tagged with Ireland, Irish Universities Association, IUA. A new report has found that international students attending Irish universities contributed an estimated €386 million to the country’s economy during 2017/2018. However, increasing student numbers overall is placing “intolerable strain” on the country’s university system, according to some. 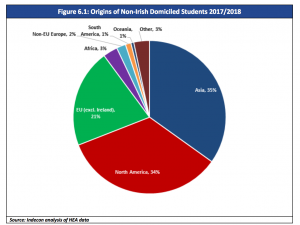 The numbers of Irish and non-Irish students has been growing in recent years, with 16,701 international students enrolled in Irish universities in 2017/18. Image: IUA. The report commissioned by the Irish Universities Association revealed that Ireland’s seven universities contributed a total of €8.89 billion to the economy in 2017/18, with international students enrolled during that period contributing €216m in tuition fees alone. International students are subject to different fees in Ireland based on whether or not they are entitled to EU fees, with those from EU countries only paying the student contribution of €3,000 annually for undergraduate studies. Meanwhile, non-EU international students can expect to pay fees in the region of €9,750 to €54,000 per year, depending on the chosen discipline. “For the purposes of our analysis, we assume average undergraduate annual fees of €18,000 for non-EU international students in Ireland,” the report explained. In addition to tuition-fee income, however, international students were found to have contributed €119.5m in non-tuition fee expenditure, including accommodation, subsistence and direct course costs. “Additionally, the indirect and induced impact of spending by international students attending Irish universities amounted to €50m in 2017/2018,” it read. It added that a percentage of international students are likely to remain in Ireland and “continue to make a positive contribution to the Irish economy” via their high-skilled labour and their contribution to the exchequer. “Visits by parents and family to Irish based international students will also make a contribution to the economy as a result of their spending in Ireland,” the report concluded. IUA director general Jim Miley said that the contribution of international students to Ireland goes beyond economic benefits. “Apart from contributing almost €400 million in export earnings for Ireland, the international student cohort from over 100 countries have greatly enriched the Irish university experience by bringing new ideas and perspectives to our campuses,” he told The PIE News. However, according to an Irish Times report, funding shortages could eventually force universities to cap places for Irish students and allow higher fee-paying international students to enrol instead. “As numbers grow, universities are fearful that they will be put in a position where places for Irish students would have to be curtailed or replaced by higher fee-paying international students,” Miley said. Speaking with Irish national broadcaster RTE Radio 1, Miley warned that Irish universities are “strapped for cash” and are using international students to plug the shortfall in state funding. He explained that state funding had dropped from €9,000 per student 10 years ago to just over €5,000 per student, with the gap in funding made up by universities “achieving efficiencies and cost-cutting”. “We don’t want to limit the number of international students, they represent just over 10% of the student population…but if [Irish universities] are faced with a limit on the state funding they are getting they must balance their books, and that has led them to increase the volume of international students,” he explained. “While having a blend of Irish and international students is good for the system overall…we do not want international students to displace Irish students, but that it can only happen if we have sustainable funding,” Miley added.